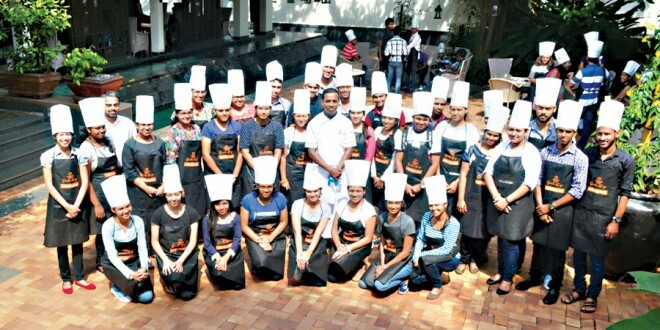 The Culinary Workshop organised by The Navhind Times’ Planet J in partnership with the Alila Diwa Goa was held on November 9 at the hotel’s Spice Studio. Seventy one students in the age group of 16 to 21 along with a couple of teachers and parents participated in the half-day workshop conducted by Chef Rakesh Kumar. The workshop saw student participation from all over Goa. The workshop commenced with an introduction. General manager Siddharth Savkur welcomed all participants. Chef Rakesh gave a brief on what had been planned for the morning and students were then divided into four groups. Each group was assigned a station. Smart black aprons with the Alila Diwa logo and chef caps were given to all participants. Located on an elevated platform that spreads naturally around a banyan tree and surrounded by a water body, the Spice Studio with its verdant surroundings was a perfect choice of venue for the workshop. Chef Rakesh had his work table placed strategically under the banyan tree and the four stations were on the elevated platform. The first item on the agenda was Mediterranean lasagne and chef demonstrated the entire process. Throughout the class he gave important tips and participant’s queries were also answered. The tempting aromas that wafted throughout the demonstration had everyone waiting to get a taste of the mouth watering lasagne. However, there was a short wait as participants had to make their own lasagne. Besides the vegetarian variety, participants also made chicken lasagne. Next on the menu was tricolour chocolate mousse and chef explained while demonstrating the dos and don’ts of making a mousse. After the demonstration each table made their own glasses of mousse and chocolate seemed to be everywhere. Everyone seemed to be having a great time, especially with the finger licking! By the end of the session, participants were more than ready for the lunch that the hotel had organised. Besides the items on the buffet, participants also got to taste the lasagne they had prepared. The planning and execution of the entire workshop by the Alila Diwa Goa team was flawless. The workshop ended with Savkur handing out participation certificates along with printed copies of the recipes. Participants were also allowed to keep their aprons as mementos. The Navhind Times plans on many such workshops in the future. I really loved the workshop and would like to thank Alila Diwa and The Navhind Times for this amazing opportunity. I will definitely be making these dishes at home now. For me it was an exciting and fun day. The hotel is beautiful and I had a lot of fun. It was an awesome experience and I was very glad to be a part of it. We got to learn new things and also be innovative. Thank you Navhind Times, Chef Rakesh and, of course, Alila Diwa Goa. The workshop was very well organised and I even got an opportunity to interact with people from different colleges. I hope The Navhind Times organise more workshops, especially in the south so that we all can attend. I had an awesome time and the food was super. It was simply awesome and I had so much fun! It was a very hands-on and fun experience. We got to try out the recipes, which were easy to follow. The Alila Diwa is a very beautiful hotel and the lunch and especially the desserts organised were absolutely delicious. My experience was a really nice one, but, unfortunately, there were too many people on one table. The food, however, was good! Thanks. Not only did I learn to make lasagne and chocolate mousse, but I also learnt teamwork. The workshop was very good. Though the chef made the dishes well we couldn’t manage as well as we wanted to. I loved the hotel and the workshop. I would like to come for more workshops organised by The Navhind Times. Also this hotel is very beautiful and I enjoyed myself. Thank you for the wonderful workshop, we were well taken care of by the staff and we learnt so much. I would like to recommend that the next time there are more workstations and fewer people at each station. This will ensure that everyone gets an opportunity to cook. Thank you very much for organising this awesome workshop in south Goa. I enjoy attending The Navhind Times Planet J workshops. Thank you for allowing me to attend this wonderful workshop. Not only did I learn but also got an opportunity to try my hand at the dishes. Since it was the first Planet J workshop I attended, I wasn’t expecting it to be so good. I had a great time. Chef Rakesh was very encouraging and the vibe at the workshop was enthusiastic. I would love to come to Alila again. I was thrilled to be a part of this workshop and learnt how to make two very mouth watering dishes. Thank you Alila and The Navhind Times. I had an awesome time. Amazing hospitality. Thank you The Navhind Times and Alila Diwa Goa for this super experience. It was an inspiring and wonderful experience and Chef Rakesh was amazing. It was a fantastic event held at the perfect spot. An amazing experience. I had an awesome day and a great experience. Absolutely loved the food and the entire experience. Thank you The Navhind Times and Alila Diwa for such a great experience.